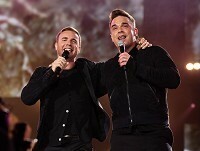 Take That's Gary Barlow and Robbie Williams will be joining forces to perform at a charity event. The duo are set to take to the stage alongside Bee Gees star Robin Gibb at the exclusive black-tie Butterfly Benefit fundraising gig in London on May 12. Robbie, who became an official ambassador for the Midlands-based charity Caudwell Children last year, has agreed to sing for the 250 invited guests ahead of Take That's record-breaking Progress tour, which kicks off two weeks later. Trudi Beswick, Chief Executive of Caudwell Children, said: "We are honoured to have Robbie as an ambassador for the charity and delighted that we have this opportunity for him to perform for us alongside Gary Barlow and Robin Gibb." The bash, which takes place at the Banqueting House in Whitehall, aims to help some of the UK's disabled children by raising funds to provide specialist equipment, treatment, therapy and support to families.